Our team of qualified tradesmen cater for design of custom panel builds “In House” to control all pumping and irrigation systems. 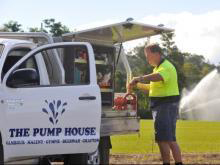 We also boast an emergency service as a continuation of the Pump House’s ongoing back-up program. Electrical Division with eight qualified tradesmen catering for design of custom panel builds “In House” to control all pumping and irrigation systems, including remote control. 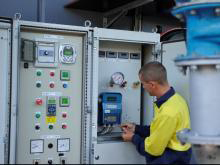 We also specialise in any onsite repairs and new installations of any pumping and irrigation equipment. Fully qualified electrical tradesmen are on our permanent staff. A cost efficient and time saving facility is offered here. At The Pump House, we have a crew of 18 servicemen and irrigation installers, plus our own fabrication workshop and electrical contracting division comprising 8 qualified tradesmen who cater for the design of custom panel builds in-house to control all pumping and irrigation systems including remote control. We are authorised electrical contractors (ELB #65488) and are licensed to carry out all types of electrical work and maintenance. Our team provides a breakdown repair service and our fully equipped service vehicles allow prompt efficient service. Additional to service work we specialise in electrical supply, including underground electrical services to farms, factories, high rise buildings and pump stations. 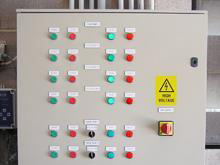 Our specialty is pump and motor control for all types of systems such as water supply, sewerage, irrigation and fire protection. If you’re after a turnkey project, we have the capability and experience to complete it.